Women love looking beautiful, hot and attractive, and they are right to want to look so, who doesn’t love an attractive woman. Women have done a plethora of things trying to look healthy, get a glowing skin, lose weight, and have great hair. They have also tried to get an attractive figure, the so-called “figure 8” or “hourglass figure”. And they try to attain this by doing what is know as waist training. So, today you will be learning 10 health facts about waist training. Before we begin exploring the medical facts about waist training, let us breifly look at what waist training is. Waist training, also known as tightlacing is practice of wearing a tightly laced corset or cinchers, in order to achieve an attractive figure and posture. Does waisting training work? Most probably, they have been many celebrities that have successfully engaged in it. When did waist training begin? Before the 16th century corsets were won by male and female Minoans of Crete. Now, let’s go on to the health facts about waist training. 1. Medically, waist training works by moving the floating ribs and reducing the abdominal space. Wearing a corset, shapewear or cincher can also alter the bustline, raising the breasts upwards and shaping them, flattening the belly, and improving posture. 2. Waist training does give you a thinner appearance, and better shape but it’s effects are only temporary, that’s why they are worn regularly. 3. Wearing a waist trainer is good for improving posture. The person who wears the trainer gets adequate back and abdominal support, helping her to get an appropriate posture. Waist training can also help you eat less. 4. Some waist trainers are made to improve thermal activity and perspiration in the abdomen. Thus, helping you exercise better and burn fat in your core. 5. After reading fact 4, you might conclude that waist training will effectively help you lose weight fast. Unfortunately, that is not so. The best way to lose weight is by proper dieting and adequate exercising, never waist training. 6. Waist Health training affects your respiration. It pushes the diaphragm, causing shortness of breath and shallow breathing. It can even lead to fainting. 7. 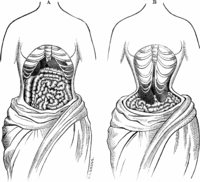 Yes, wearing a corset for a long period of time can squeeze your organs, even deforming them. The stomach, liver and lungs are affected, hence blood flow to the organ is affected. This can also lead to heartburn and acid reflux. That is why it is not advisable to use them for a long time. 8. A lot of women have wondered if waist training was safe for pregnant women and if it can cause miscarriages? Once you get pregnant, stop using waist trainers it could deform the growing baby. And concerning the miscarriage issue, I read a lot of questions on Yahoo Answers about it and very few women said to have miscarried while using waist trainers when pregnant. 9. Wearing waist trainers will make you urinate often. The pressure to your abdomen gives your bladder little time to fill up. Instead, any small amount of urine in the bladder will be let out immediately, causing incontinence. Please don’t attempt to hold your pee for a long time. 10. Another question ladies ask is, does a waist training affect their period? There is no medical evidence that suggests so. However, Lucy from LucyCorsetry implied that wearing corsets helped in reducing painful uterine contractions. It is good to look attractive always, but never at the expense of your health. Everything is achieved the right way through moderation, it is recommended to wear corsets for 1 to 2 hours a day, not the whole day. And make sure you talk to your physician before, and when you wear waist trainers.